How can I schedule when to be seen online/offline? What's Crisp EU GDPR compliance status? How to sign my GDPR Data Processing Agreement (DPA)? How can I always appear as online? How can I close & delete my Crisp account? Your Crisp chatbox can show the support to be either online or offline (away). This lets your users know whether they can get a quick reply, given you are online. You can enable/disable a mode that we call "Availability schedule". This feature lets you configure days and hour timespans you want to be seen as "online". You will be seen as "offline" on days and hours that are off-schedule. 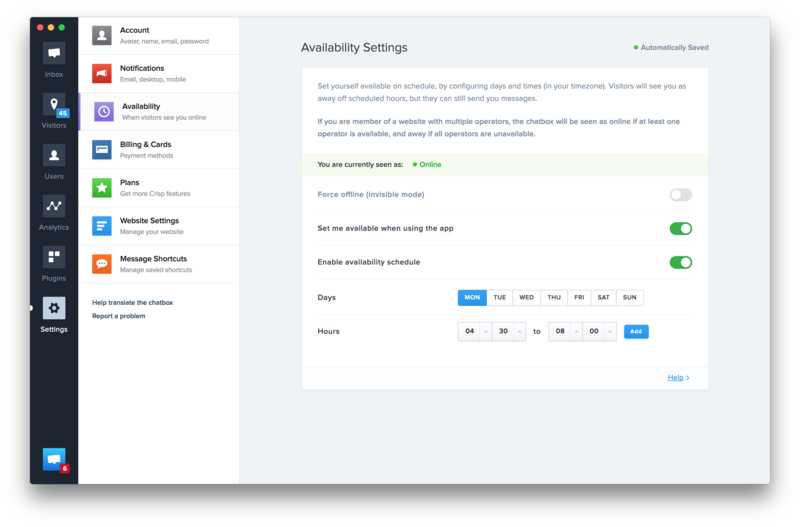 Go to the availability settings: click on the cog icon on the left sidebase, then click on "Availability schedule"
Configure your "online" days and hours. In this case please, enable only Set me available when using the app. In this case, ensure your availability schedule is disabled, otherwise, you will be considered as online during your working hours. Then, Toggle the "Available on schedule" option to ON. Then, Toggle the "Force offline" option to ON. Crisp is on a 24h hours format. So let&apos;s say you work from 9am to 6pm, you will have to schedule Crisp from 09:00 to 18:00.